Here are some exclusive photos taken Friday of the new W Boston Hotel & Residences in the Theatre District. The building is located at 100 Stuart Street which is directly across the street from restaurants Rock Bottom and California Pizza Kitchen. 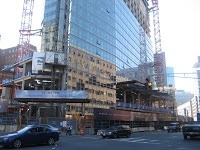 The building is one of Boston's newest luxury condo/hotels and is currently under construction. 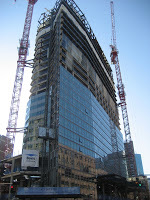 There will be 235 hotel rooms situated on floors 3 through 15. The W Residences will feature your typical luxury condo building amenities including valet parking, 24 hour concierge, fitness center and W's signature Whatever/Whenever service which I think explains itself. Construction is scheduled to be completed in Fall 2009. Pre-construction prices have yet to be released. If you are interested in this development, you can contact me to be your buyers agent or stop by the sales office which I believe is still located at 200 Newbury Street. In the next several months I would expect to see an on site sales office. I'll keep you posted on pricing and unit availability at The W.
Last updated April 25 at 3:54 pm.